Kids Yoga Teacher shares her study of the top 5 benefits Yoga offers to young yogis. I Breathe in, A happy body, mind & soul -­? I Breathe out , and I Smile. I created Kaya Kidz Yoga in 2008 and have been sharing yoga with children of all ages who come in a variety of colors, religions, shapes and sizes! Throughout the past four years I have studied the effects of yoga on kids. I have used my experience and training as a kids certified yoga teacher to compile a list of what I believe to be the top 5 benefits of yoga for kids in their daily lives. 1. Balance of Body & Mind – When a child finds balance in his body, he is then balanced in his mind. When a child is learning to balance in a yoga pose and falls down, he gets back up, tries again, then falls and gets back up to try and try again. When the child finally finds his balance in the pose he has truly found balance in his mind as well by learning to keep trying until acheiving a positive outcome. 2. Concentration/Focus – By learning to balance, a child naturally is also learning to build concentration and focus. As a child is learning to still his body to hold a yoga pose, he becomes unaware of everything around him. His mind becomes focused on the task at hand, which is to find his balance; this is yoga. 3. Breathing Awareness – When a child is learning to balance in a yoga pose he may become frustrated and feel challenged. By learning to take a deep breath and then trying again he builds an awareness of how proper breathing calms the body. By teaching kids to breath properly gives them control of many aspects in their life such as: helping fall asleep, doing better in sports, staying calm before a school exam, and how to relax when trying something new. 4. Builds Self-­?Confidence – Learning to hold a yoga pose or to sit and breathe brings awareness to the child of how he is in control of his own body. By feeling in control the child develops a strong awareness of himself. This teaches a child the power of self-­?control and self-­?discipline in making good decisions. I have seen many tweens who could otherwise be influenced in the wrong direction. 5. Happiness – Bringing balance to the body and mind, learning to concentrate and focus on the task at hand, and using the breath to remain calm, builds self confidence which leads to the most important benefit of yoga... HAPPINESS! Stephanie is a certified kids yoga instructor with training from Rainbow Kids Yoga, Mini Yogis, Yoga Ed, ACE Kids Fitness, Kindermusik ABC Music & Me, and a Yoga Instructor with 200hr RYT. Stephanie believes in the tooth fairy, paying it forward, and world peace! 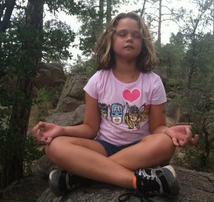 Her best yogi teachers are her 8 year old twin girls and her doggie named Sam.